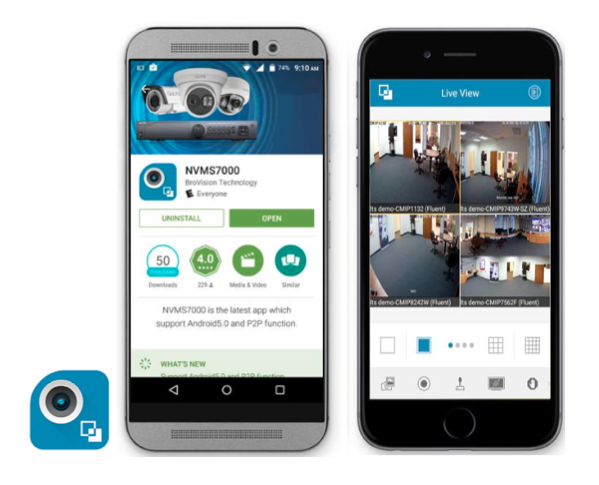 You have a sweet new high definition camera system installed, but now you want to know how to view your cameras on your smartphone. Follow these easy steps and you will be able to get the app, live live video, view recordings, and more. If you’re struggling with the app or have more questions, you can find the user manual in the app itself. 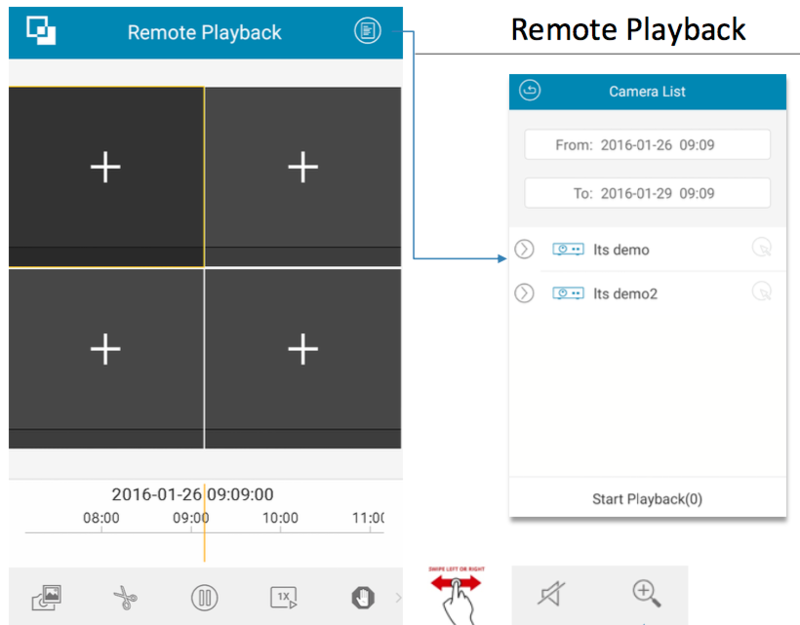 You can use remote playback to see what your cameras have seen from your phone. Here’s how to get to it. Note: the recap video button is designed for a short moment backup. If you drag the timeline, it will cause the record to stop. And if you want to back up a long period of time, please use the PC to backup. Live View can show you what’s currently going on with your cameras. Just click on the logo icon in the upper left corner to bring down the menu and then click on Live View. If you have a PTZ camera, you can move the camera from your phone. Just click on the controller icon and it will let you move around just using your finger. 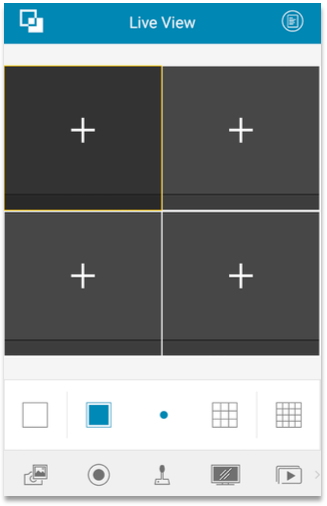 It also gives you a few tools to help you out in viewing including cruise, zoom, focus, iris, and preset. The preset function helps you set where you want the camera look at certain times of the day. If you have a motorized zoom camera, you can also use the PTZ control but you can only use the zoom feature. You can also change image quality by clicking on the screen icon down at the bottom. It then gives you some options. There are two defined image quality types provided: Clear and Fluent. The video by default comes in the Fluent, so if you want a clearer picture, click on Clear. You can also customize the image quality yourself. 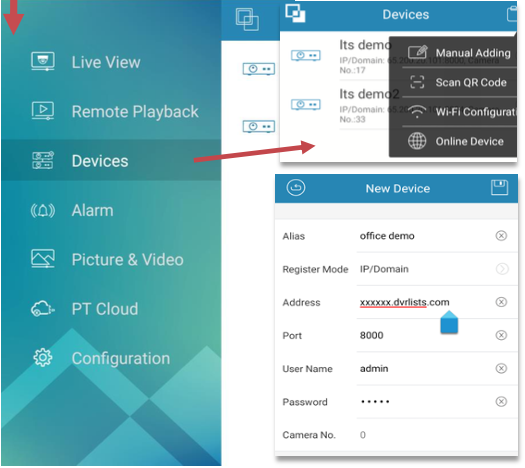 The Picture and Video section can help you view and manage the video files and pictures that you manually record and capture in Live View and Remote Playback. These files are stored in the directory of the SD card. And from here you can also share the pictures and videos to other apps. To get to Picture and Video click on the logo icon in the upper left corner to bring down the menu. Then click on Picture & Video. In order to select a camera list from favorites, here are the following steps. Click on the icon in the upper right corner to bring down a menu. The most the channel can handle is up to 16CH, so save 1-16 and 17-32 as two favorite groups. This lets you switch from one to the other easily. This is a new feature that can let you enable alarms from your phone. 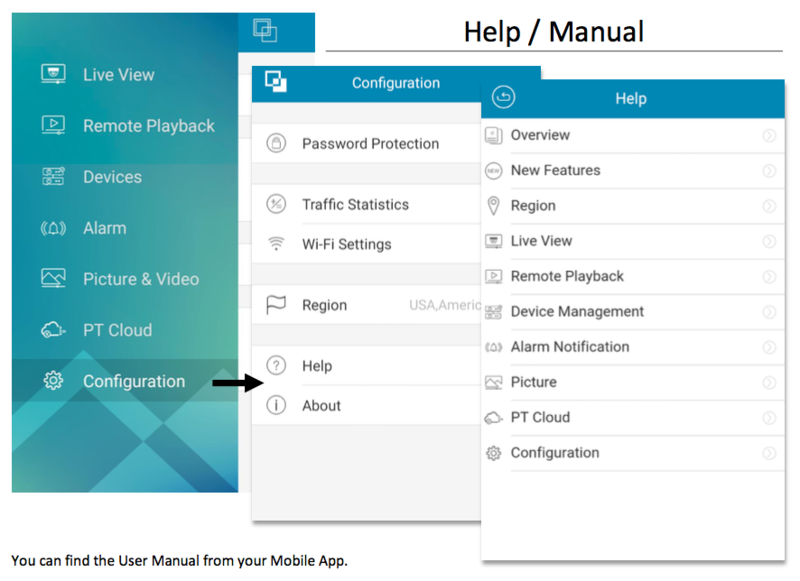 But in order to use this feature, your camera/DVR/NVR must enable the Motion Detect or VCA function, and the Notify Surveillance Center section must be enabled. To get to Alarms, just click on the upper left logo icon to bring down the menu and then click on Alarm.